Ed and Jamie Shand and their entire crew are dedicated to providing the highest quality gutters and gutter cleaning services. Creative Siding Decking and Seamless Gutters Incorporated was established in 1985. Ed Shand the founder of Creative has been installing siding, windows and trim, entry doors, garage doors and shutters since 1973. In 1985 Ed created his own company and venture out on his own. In 2003 his son Jamie fresh out of high school joined the company learning his craft from his father, and the company became a true father and son family owned business that would flourish and grow in the years to come. 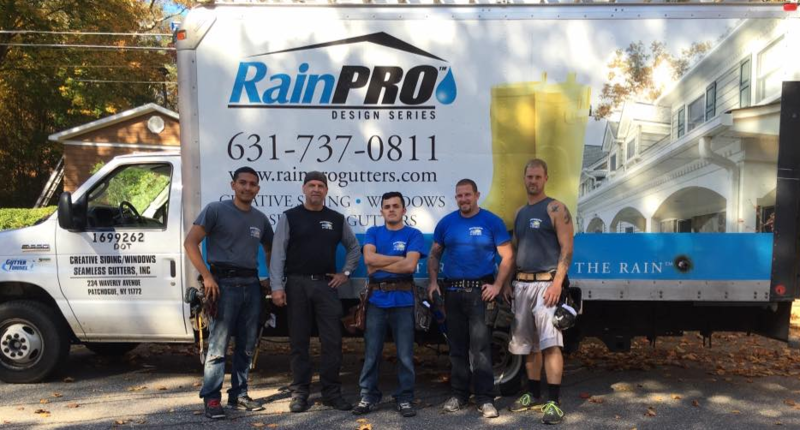 Creative Siding Decking and Seamless Gutters Incorporated located on Waverley Avenue in Patchogue, New York have been doing business for over three decades serving the long island area. This family owned and operated business prides itself on superior workmanship, sterling business practices and delivering the best possible product to the homeowner. Our once small family-owned company has grown over the years; you may have seen our trucks on the road in your neighborhood. Our fully trained and experienced crews bring to your home only the highest quality materials, and have the experience and qualifications to get the job done Right! It is a proven fact that family owned and operated businesses will consistently outperform every other type of business when it comes to quality of workmanship. Our trained and experienced crews are all Long Island residents and their superior workmanship will continue to provide Long Island homeowners the best possible job at a reasonable cost. Creative Siding Decking and Seamless Gutters will always do a better job because we care! Seamless Gutters Installed and Repaired, insulated windows, vinyl siding, decorative trim, and soffits are just a few of the many services we provide to the homeowners here on Long Island. We repair and install copper gutters; we are also a certified Rain Pro Gutters installation company. Installing 5inch and 6 inch seamless gutters and half round gutters in All Colors. We can also make repairs to your home while we are there, such as replacing wood rot, repairing gutters or trim that blew off or fell down during a storm. We will replace roof shingles and siding that has been damaged. All Types of Gutter Restoration, wood gutters, galvanized gutters, copper gutters, PVC gutters and half round gutters in all colors. For free estimate simply give us a call or fill out the contact form on this page and we will call you.